An ancient Japanese proverb says, “the meeting between two persons is where everything begins.” It is also how the extraordinary story of Luce came to be, a story that we had the privilege to experience through a historical tasting going back to 1997 of this Iconic wine hosted by Lamberto Frescobaldi at the magnificent Casa degli Atellani in Milan. Luce was created following the meeting of two friends and giants of modern winemaking, Vittorio Frescobaldi, and Robert Mondavi. At the beginning of the 1990s, the two gentlemen decided to give life to the first and only collaboration ever in Italy between two great families of wine with the objectives to produce, in Montalcino, a unique wine, an expression of two worlds, two cultures but above all, with a common passion for wine. 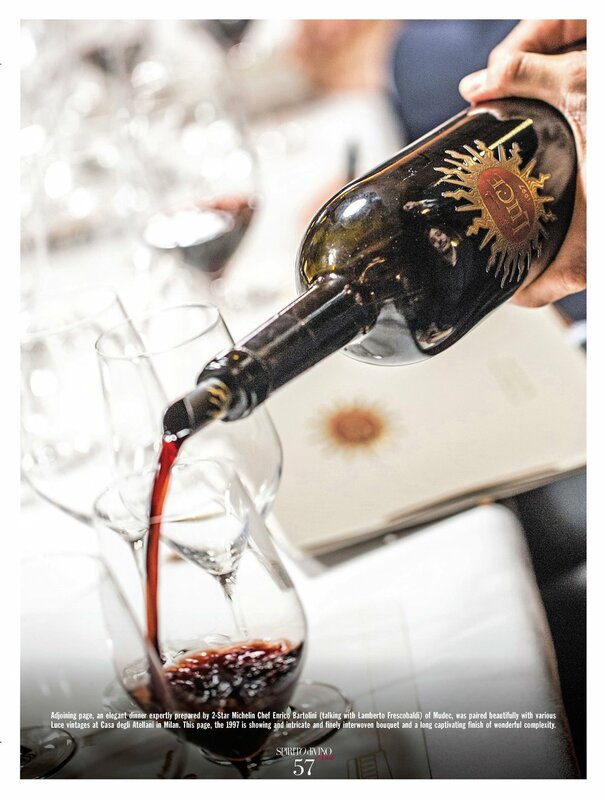 Luce was the first wine that was ever produced in Montalcino which was devoted to joining the elegance and structure of Sangiovese with the roundness and caress of Merlot. The project was first presented to the world with the vintage 1997 when it generated intense curiosity and enthusiasm for its innovation and originality. The last vintage elaborated jointly by the two families was the 2004, and since, Lamberto Frescobaldi continues to personally follow the project independently. 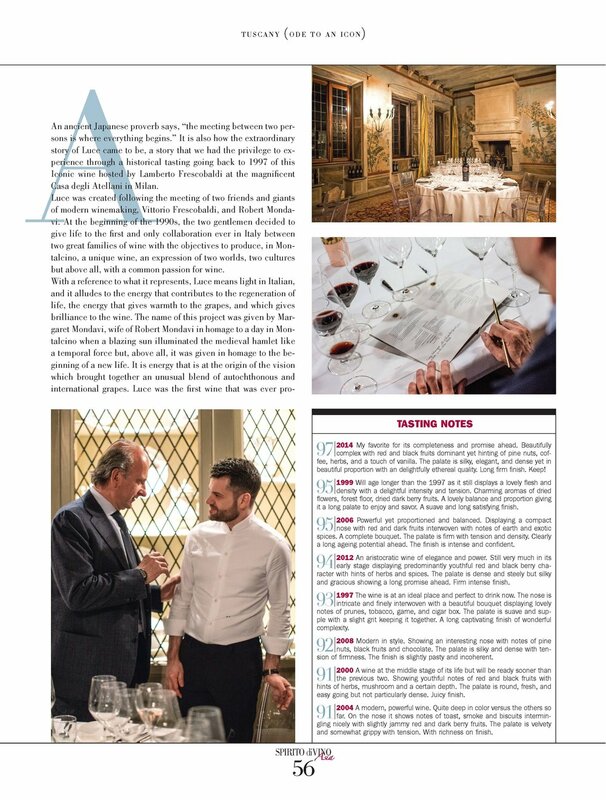 Today, he is assisted in this task by Stefano Ruini, the technical director and winemaker of Luce, who himself has 20 years of experience working in iconic Châteaux of the Médoc where he had the opportunity to develop a philosophy dedicated to producing great wines of finesse and elegance. In the heart of Val d’Orcia, Montalcino with its rugged and wild landscapes. Here, men have known how to establish with nature a relationship based on respect keeping it still in time and its territory unspoiled. Situated at 564 meters above sea level it conserves still today its spirit of a thousand year of history. The rolling hills surrounding Montalcino are characterized by a constellation of small woodlands mixed with macchia and, planted olive trees and vines, symbols of a pluralist agriculture. Its soil is greatly diverse with schist alternatively rich in Galestro or clay. The light is bright and intense during the day, and the wind is persistent with warm days and cool nights favoring an ideal climate for the long but complete maturity of the grape and favors an intense accumulation of aromas. It is in this extraordinary territory that is situated the “Tenuta Luce della Vita,” the name of the winery which produces this legendary wine. Located southwest of Montalcino, it covers 247 hectares of land which 88 are planted with vines. Some of the vines were planted in 1977 while more of them between 1997 and 2007 planted in some of the highest areas of the territory between 350 and 420 meters. In the highest zones, the soil is particularly rich in Galestro where Sangiovese is planted. In the lower areas, clay predominates, and Merlot is planted. Viticulture follows a certified organic regimen, but as Frescobaldi told us during the tasting, this is not something they feel the need to advertise, for them, “it is a philosophy, not a marketing strategy.” The harvest is made in two different moments, with Merlot picked earlier, and the Sangiovese last. Each is vinified and matured separately until the final blend of 50% Sangiovese, and 50% Merlot is assembled for its final maturation a carefully considered mixture of old and new French oak barrels. Over dinner prepared by 2-Star Michelin Chef Enrico Bartolini from the restaurant Mudec in Milan and following this extraordinary historical tasting, Frescobaldi told me: “from the outset in the early 1990s it was not the objective to create a wine for the international taste. 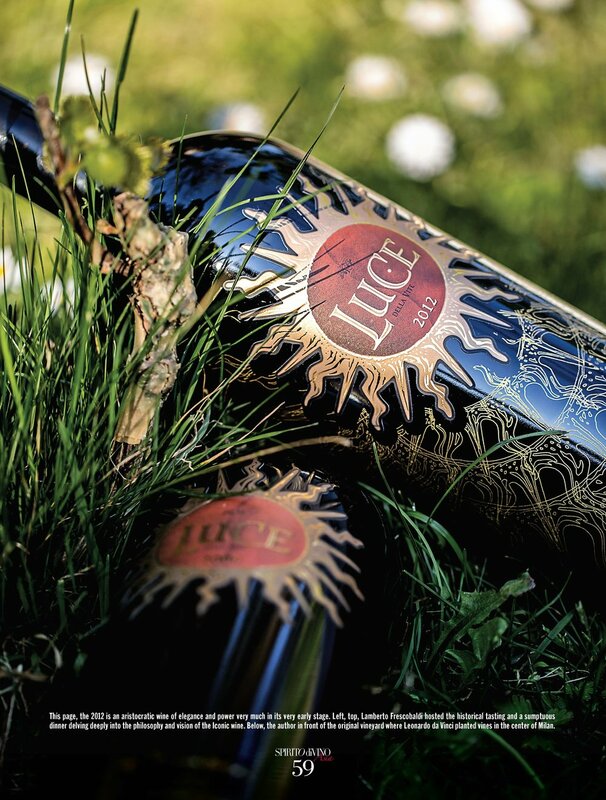 The motivation was to innovate and create a unique wine that would, in its own way, provide wine lovers with a different and unique interpretation of the land it is from.” Luce is the iconic wine of Tenuta Luce della Vite, a wine that distinguishes itself among the best that Italy offers to the rest of the world. 93| 1997 The wine is at an ideal place and perfect to drink now. The nose is intricate and finely interwoven with a beautiful bouquet displaying lovely notes of prunes, tobacco, game, and cigar box. The palate is suave and supple with a slight grit keeping it together. A long captivating finish of wonderful complexity. 95| 1999 Will age longer than the 1997 as it still displays a lovely flesh and density with a delightful intensity and tension. Charming aromas of dried flowers, forest floor, dried dark berry fruits. A lovely balance and proportion giving it a long palate to enjoy and savor. A suave and long satisfying finish. 91| 2000 A wine at the middle stage of its life but will be ready sooner than the previous two. Showing youthful notes of red and black fruits with hints of herbs, mushroom, and a certain depth. The palate is round, fresh, and easy going but not particularly dense. Juicy finish. 91| 2204 A modern, powerful wine. Quite deep in color versus the others so far. On the nose, it shows notes of toast, smoke, and biscuits intermingling nicely with slightly jammy red and dark berry fruits. The palate is velvety and somewhat grippy with tension. With richness on the finish. 95| 2006 Powerful yet proportioned and balanced. Displaying a compact nose with red and dark fruits interwoven with notes of earth and exotic spices. A complete bouquet. The palate is firm with tension and density. Clearly a long aging potential ahead. The finish is intense and confident. 92| 2008 Modern in style. Showing an interesting nose with notes of pine nuts, black fruits, and chocolate. The palate is silky and dense with a tension of firmness. The finish is slightly pasty and incoherent. 94| 2012 An aristocratic wine of elegance and power. Still very much in its early stage displaying predominantly youthful red and blackberry character with hints of herbs and spices. The palate is dense and steely but silky and gracious showing a long promise ahead. Firm intense finish. 97| 2014 My favorite for its completeness and promise ahead. Beautifully complex with red and black fruits dominant yet hinting of pine nuts, coffee, herbs, and a touch of vanilla. The palate is silky, elegant, and dense yet in beautiful proportion with a delightfully ethereal quality. Long firm finish. Keep!